A Notable New Year – Giveaway!!! It’s the time of year when many people reflect on their lives and determine what they want to do to enhance it. It’s a time of goal setting, with friends and family members excitedly sharing their resolutions. We make a decision and convince ourselves that this year we’re going to shed the pounds, organize our home, save more money, start a business…accomplish a goal. Share what your New Year’s Resolution is for a chance to score a copy of The Goal Tracker Journal, 2nd Edition, to help you achieve this goal (and many more) this year! Just post a comment with your New Year’s Resolution and you are automatically eligible to win! The contest closes on Thursday, March 7, 2013 at 11:59 pm. The winner will be randomly selected from all posts and announced on Friday, March 8, 2013. *Contest is open to continental U.S. residents, only, excluding Alaska and Hawaii. Sorry, exclusions are for shipping purposes only – nothing personal! This contest is closed. Congratulations to Carmen, the winner of the Notable New Year Giveaway! This entry was posted in Blog on February 1, 2013 by LifeNotables. Congratulations on launching your blog! I like it. One thing I’m working on changing is cooking more at home. My goal is to obediently pursue the Vision God has given me for ministry and pursue it with strength, courage and confidence!!! Goal Getters Challenge #2 – Challenging the Will: to speak or not to speak? A Student Planner designed with homeschoolers in mind! 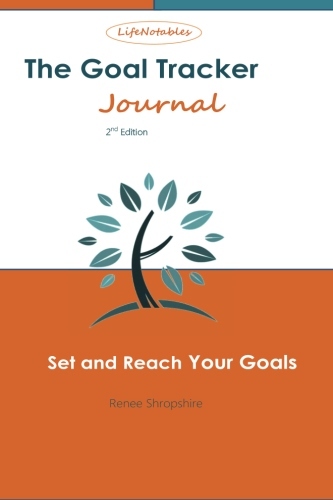 A simple way to set and reach your goals! Taking note of the moments and making the moments notable!